William dreams of acting and writing plays. This ambition takes him from the quiet country town of Stratford to the great playhouses of London, where his talent takes the city by storm. The life of Britain’s most famous playwright told for children ready to tackle longer and more complex books. With internet links to recommended websites to find out more about Shakespeare and his plays. 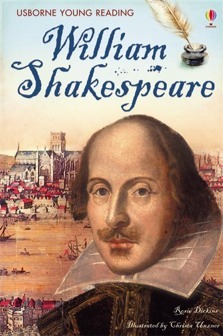 Usborne has put together an exciting and informative account of [Shakespeare’s] life... The perfect introduction.